Judge Arthur S. Guerin may have had a point! 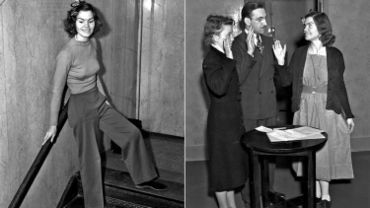 Those who wore pants before Ms. Helen Hulick, certainly interfered with the administration of Justice. So the judge was relying on precedent as Helen was setting one. Was it the pants or going braless? I think it�s interesting that the order was issued by to someone who showed up at work in his mourning clothes! Well Sam thanks for this light piece of history. This kindergarten teacher in 1938 had more nerve than I probably would have had at that time, * she wore pants to the court * the judge did not take kindly to that & put her in jail. Well this is where the good part is "the public wrote letters to the judge to free her" . He did! The Power of letters even in those days long ago, just goes to show that our word means alot more these days through social media. Thanks for posting the article, Sam. It took us back to them good old days. It's very funny to read about the upset a woman created in court by wearing slacks in those days, but the judges who think they are king of their courtroom and rule on issues purely on the basis of their personal views and not on the law, are still with us today. LMAO !! "..in his mourning clothes.."- FANTASTIC; THX SAM for my Sunday morning laugh! At least, good on that Appellation court! Good grief. How times have changed yet remained the same. BTW-good and correct observaton by Bruce as well! -sorry Sam for off-topic, but here*s another hindrance of justice in some ways..how about that..pls SIGN. Together you are withholding $15 million in campaign contributions donated by political supporters to put Democrats in the Senate. Stop hoarding campaign cash and help us Save the Senate." This would be hilarious if it wasn't so pathetic. Denied justice because she wore slacks? OK, so this was long before the Women's Lib movement; but seriously! Here is more proof that mavericks are the ones responsible for all social, ethical and moral progress. And to think there are forces in this country that would take us to back before even this. What strides we women have made - but what a long path still lies ahead of us. This is too funny.......Thank you for the good Sunday morning laugh!!!!! Love it..........I think Katherine Hepburn was one of the first women to wear slacks too. I immediately thought of Hepburn too. Nothing like a pompous fool to remind us of how far we've come...and how far we need to go. Our world is too artificial for me. Thanks for sharing. Noted. Thanks, Sam. Yes, I see others thought of Katherine Hepburn.....Lauren Bacall was another. This is where the media, via entertainment, can have a very tangible influence on the public. I am so thankful for women like them. For decades I've thought that the wearing of pants (under their robes) by male judges obstructed the administration of justice - not the pants exactly but the male privilege of those wearing them. I see in his first comment that Sam had the exact same reaction. I certainly agree with those who admire the huevos demonstrated by Ms Hulick. I thank this woman, Katherine Hepburn, Lauren Bacall and the other early pants-wearers for helping to make it acceptable for us to wear this comfortable and practical piece of clothing. I can't imagine that she was wearing slacks while teaching kindergarten. That would be a very unusual school, not just in 1938. I don't know what teachers are wearing now, but even the female students had to wear a skirt or dress when I was going to school in the 50's and 60's. It would have been unheard of for a female teacher to wear slacks. Yet another woman wronged in 2014 RIGHT HERE! I love the slacks in the photo so much I would love to have them in several colors and three pairs in black! Hepburn was one of the first.